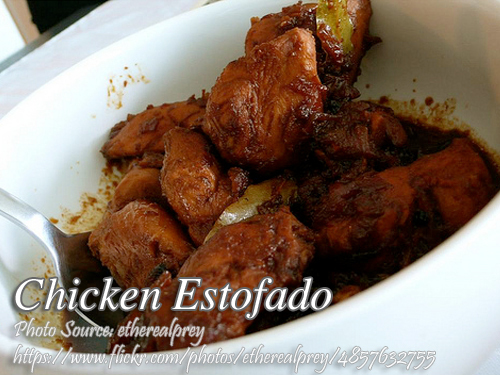 You will love this chicken estofado not only it’s easy to cook dish, the ingredients are also very simple and few. If you are tired of cooking chicken adobo, and want something with a little bit of Asian twist, I think this dish is a good substitute specially if you like dishes with a little bit of sweetness. You can cook this in any occasion or any ordinary day. This is how to cook this dish; in a medium size non-stick wok or carajay heat cooking oil and saute garlic until fragrant. Add in the onions and saute until tender. Then add the chicken pieces and stir cook until the chicken turns light brown. Put in the star anise, bay leaf, brown sugar, pepper, soy sauce, oyster sauce and water. Simmer the chicken until cooked and almost of the liquid has evaporated and the sauce is thick. Be careful not to burn the chicken by stirring it constantly. Turn off heat and serve hot. You can also garnish it with chopped green onion. To see the rest of the recipe with the exact measurement of ingredients, continue reading. You will love this chicken estofado not only it's easy to cook dish, the ingredients are also very simple and few. In a medium size non-stick wok or carajay heat cooking oil and saute garlic until fragrant. Add in the onions and saute until tender. Then add the chicken pieces and stir cook until the chicken turns light brown. Put in the star anise, bay leaf, brown sugar, pepper, soy sauce, oyster sauce and water. Simmer the chicken until cooked and almost of the liquid has evaporated and the sauce is thick. Be careful not to burn the chicken by stirring it constantly. Turn off heat and serve hot. You can also garnish it with chopped green onion. Your chicken estofado looks delicious! I try to cook this for dinner tomorrow. Thanks! Hi Aiza, good luck on your cooking and I hope it turns out well!